Dumble musical instrument amplifiers is a guitar amplifier manufacturer in Los Angeles, California. A one-person operation, Alexander "Howard" Dumble makes each amp personally. Dumble amplifiers are the most expensive boutique amplifiers on the used market, and prices have risen rapidly. In 2012, Vintage Guitar magazine described the Dumble Overdrive Special as the most valuable in the product line, with used amplifiers fetching between $70,000 and $150,000. Other examples have sold for more. Dumble currently builds two or three amplifiers per year, primarily for celebrity musicians and studios. He prices them similarly to the used market to dissuade resale. Dumble services and refurbishes his original amplifiers for a fee, and many players buy used Dumble amplifiers and have Dumble refurbish them. Carlos Santana and Ben Harper, for example, both bought their first Dumble used, and had Dumble refurbish the amp for their particular playing styles. Howard Dumble began modifying Fender tweed and blackface amplifiers in 1963. Before he was 21, Mosrite, in Santa Cruz, hired Dumble to build a special line of Amplifiers for The Ventures. By the late 1970s, he was modifying and building high-gain amps in the way that Randall Smith of Mesa Boogie, and others did. Dumble, however, was not interested in selling amplifiers in greater numbers, but focused solely on getting the best possible sound. Building to order only (even building his own speaker cabinets by hand), his amps gained a positive reputation and became highly sought after by professional musicians. Dumble became known as a tube electronics master, and his high end clientele gained him a reputation as a reclusive amplifier tech to the stars. Much of the company's PR over the years has been word of mouth. Howard Dumble did some interviews and advertisements in the 80s—but few people knew about him, even in the professional music community. Carlos Santana, for instance, only heard of Dumble in reference to Stevie Ray Vaughan in the late 90s. After someone loaned him an amplifier (it wasn't for sale) he "was hooked for life." He subsequently contacted Howard Dumble, and was able to buy a used amp and have Dumble refurbish it. Reportedly he has since bought more. Since the 1980s, Dumble has covered the preamp circuitry of his amps with a thick layer of usually opaque epoxy, presumably protecting his schematic's exact design from prying eyes. There are also practical reasons for covering circuits in epoxy: it keeps the parts firmly in place and dissipates heat well. One such application of this was in the 1971 Urei 1176LN version C. Bill Putnam covered the additional "Low Noise" portion he developed for the 1176 in version C with black epoxy. Howard Dumble legally changed his name to Alexander, and prefers to be referred to as "Alex". Since Dumble individually tailors his amplifiers, no two are exactly the same. However, most fall within a few known models. These models amount to general circuit styles and chassis layouts. The Overdrive Special is a two channel amplifier, with a clean channel and a second "overdrive" channel. This overdrive channel "cascades" from the first channel into at least one additional gain stage in the overdrive channel. This means that the clean channel tone stack and gain stages cascade into the gain stage of the overdrive channel, overdriving the clean channel. In a sense, the overdrive channel sits "on top" of the clean channel. This is Dumble's most popular model, and subsequently is the most frequently seen. That said, the Overdrive Special (ODS) varies from decade to decade, and serial number to serial number. For example, though most ODS amplifiers use 6L6 tubes in the power section (commonly associated with Fender amps), some have EL34 tubes (commonly associated with Marshall amps). On the other hand, even the many 6L6 versions of the ODS vary considerably. For example, some have a clean channel that stays clean "all the way up to 10" (referencing a gain potentiometer ranging from 1 - 10). Others have a clean channel that starts to "break up" around 3. Some overdrive channels can only reach a minimal amount of breakup, even when dialed up. However, most ODS overdrive channels have a large amount of tube distortion available. Many later versions of the ODS have "HRM" controls on the inside of the amplifier, which is a "hot rodded Marshall" tone stack that sits "on top" of the overdrive channel or, in other words, comes after the Overdrive channel tube gain stage. There are commonalities across all ODS amplifiers. Firstly, the ODS amps are known for their harmonic richness in the overdrive channel breakup, and transparent "open-ness" in the clean channel. Guitarists describe the overdrive channel using terms like "sustaining," "blooming," and "musical"—and call the clean channel "fast," "huge," and "responsive." Robben Ford describes the tone of the ODS as having "...a perfect sonic curve, the lows are deep and rich but not unclear, it doesn't mush out like some amps will. You have the frequencies there for your use. The mid range [is] punchy and clear and the high end, bright, clear but doesn’t hurt your ears. It’s loud but it sounds good […]." In an interview with Premier Guitar, Robben Ford claims that Dumble told him that the original inspiration for the Overdrive Special came while watching Ford play live in the 70s at a bar in Santa Cruz. Ford was using a mid-60s blackface Fender Bassman, and running a tube screamer in front of it to overdrive the tubes to breakup. Supposedly, Dumble liked Ford's sound, and while contemplating it had the revelations that led to the original Overdrive Special. Since buying his ODS, Ford has almost exclusively used his original Dumble or an exact clone of it in live performances. An Overdrive Special amplifier with an internal Reverb Circuit. The Steel String Singer is an adjustable single channel "clean" amplifier with reverb.. Fewer than 12 of the original Steel String Singers have been accounted for. As is typical with Dumble amplifier models, the Steel String Singer (SSS) varies from serial number to serial number. For example, The first SSS (made for Henry Kaiser) has a built-in vibrato circuit. Also, despite its reputation for a clean sound, the earlier SSS (and possibly #7) breaks up when the input gain is turned up or pushed by a strong input signal. Earlier versions also had more complicated phase inversion techniques that had been pioneered in vintage high fidelity amplifiers, and Fender style transformers. Starting with #4, Dumble simplified the phase inversion and gave the amp more negative feedback, which further cleaned up the signal. These updates significantly changed the sound and feel of the circuit, and became standard to the SSS model from #4 and on. The sound the Steel String Singer is most known for is a "clean feedback" effect, in which the amplifier feeds back, even though the signal remains clean. This is most apparent in later SSS models, though a balance of factors contribute to this behavior, and earlier SSS versions and other Dumble models reportedly imitate the effect under certain conditions. Most common features of every Steel String Singer are control oriented. Every SSS has special high and low cut filters that adjust overall tone late in the circuit. Every SSS has reverb, and every SSS has special coupling techniques and a larger chassis style. Guitarists often characterize its sound as extremely clean and compressed, with dynamic response and a lush reverb circuit. Its EQ is generally considered relatively flat internally, but malleable through the front panel controls and overall responsiveness. There are reportedly "higher highs" and "lower lows" that are not often heard through other amplifiers, and a significant amount of harmonic response to the strength of the input signal. Notable owners and users of the Steel String Singer include: Stevie Ray Vaughan, Eric Johnson, David Lindley, Jackson Browne, John Mayer, Kirk Hammett, and Henry Kaiser. A single channel "no frills" combo amplifier, similar in appearance to the tweed Bassman. This was the most expensive amplifier on Dumble's amplifier price sheet in the 90s. Bonnie Raitt is a notable original owner of a Manzamp. One of the earliest Dumble amplifiers, this was also the model that Stevie Ray Vaughan and Double Trouble used for 80% of the guitar tracks on their debut album, Texas Flood, which was recorded at Jackson Browne's studio. Browne is a long time friend of Dumble, and owns some of his earliest amplifiers (including the first Overdrive Specials). 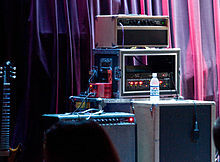 Jackson Browne's collection of amplifiers introduced Vaughan to Dumble's amps, and Browne introduced Vaughan to Dumble so that he could buy his first Steel String Singer. The Winterland was a 300 watt bass amplifier Dumble made in the 1970s. Dumble also made a tube-buffered external effects loop called a Dumbleator. A few Dumble amps have a Dumbleator circuit built in, but most have "un-buffered" input jacks that tap directly out of the pre-amp and into the power amp. Dumble likely created this external loop because of the difficulty of fitting effects loop buffering into the amplifier chassis (and the limited use of effects loops for most players). The Dumbleator has separate Send and Receive controls for the effects, and a Bright switch on at least the return. Later models also have a Bright switch on the send. Dumble also makes stereo versions. This effects loop buffering is essentially a cathode follower for the send, into a gain stage for return. Lowell George had an early custom Dumble head he used for most of his career. Ben Harper – 3 × Overdrive Specials (50w head + 2×12" Cabinet, 100/50w 1×12" Combo, 100/40w Head + matching 1×12" Cabinet)  In March 2016, Harper explained that Dumble had him plug his guitar directly into the oscilloscope so he could note the frequency patterns of Harper's instruments and voice Harper's Overdive Special accordingly. ^ Hunter, Dave (May 2011). "Robben Ford's '82 Dumble OD Special". Vintage Guitar. pp. 62–64. ^ Hunter, Dave (June 2011). "25 Most Valuable Amplifiers". Vintage Guitar. pp. 38–40. ^ "150 watt Dumble amp specifically made for Merle Haggard! $200,000!!! from GrooveSession - Download Facebook Videos". GenFK.com. Retrieved 28 May 2018. ^ a b "Ben Harper's Arresting Developments". Retrieved 28 May 2018. ^ a b Pittman, Aspen (2003). The Tube Amp Book: Histories, Specs and Schematics for Fender, Marshall, Vox, Ampeg, Gibson, Hiwatt, Mesa/Boogie, Matchless, Groove Tubes, Gretsch, Rivera, Dr. Z, Trainwreck and Many More. Hal Leonard. p. 13ff. ISBN 9780879307677. Retrieved 27 August 2012. ^ Fjestad, Zachary R.; Fjestad, S. P. (2003). Blue Book of Guitar Amplifiers. Blue Book Publications. ISBN 9781886768420. ^ Molenda, Michael (2010). Guitar Player Presents Carlos Santana. Hal Leonard. p. 77. ISBN 9780879309763. ^ a b Falla, Jeffrey; Johnson, Aurora (2011). How to Hot Rod Your Fender Amp: Modifying Your Amplifier for Magical Tone. Voyageur. p. 143. ISBN 9780760338476. ^ "1176 and LA-2A Hardware Revision History - Universal Audio". Retrieved 28 May 2018. ^ a b "Dumble video/sound clip reference, real Dumbles only please - Page 17 - The Amp Garage". ampgarage.com. Retrieved 28 May 2018. ^ "Rig Rundown: Robben Ford". Retrieved 28 May 2018. ^ "Dumble SSS - history and info - The Amp Garage". ampgarage.com. Retrieved 28 May 2018. ^ "Dumble amplifiers information archive - courtesy of Rob Livesey". thesubjectmatter.com. Retrieved 28 May 2018. ^ "Eric Clapton Talks Gear, Robert Johnson and New Album, 'I Still Do'". Retrieved 28 May 2018. ^ Moseley, Willie G. (May 2004). "Stephen Bruton In the Spirt of the Ft. Worth Tradition". Vintage Guitar. Retrieved 20 December 2011. ^ Heidt, John (May 2001). "Larry Carlton: The Return of Mr. 335". Vintage Guitar. Retrieved 20 December 2011. ^ Forte, Dan (August 2009). "Robben Ford". Vintage Guitar. Retrieved 20 December 2011. ^ Forte, Dan (February 2007). "David Lindley: String Theory". Vintage Guitar. Retrieved 20 December 2011. ^ Dirks, Rebecca. "Rig Rundown – John Mayer". Premier Guitar. Retrieved 9 June 2014. ^ Kening, Dan (August 1976). "Lowell George of Little Feat". Guitar Player. Archived from the original on 2012-01-22. ^ Forte, Dan (April 2010). "Carlos Santana". Vintage Guitar. Retrieved 20 December 2011. ^ "Stevie Ray Vaughan Rig". Guitar Geek.com. 2010. Retrieved 7 October 2013. ^ "Henry Kaiser's 5 Essential Effects". premierguitar.com. June 2013. Retrieved 4 May 2014. ^ "Joe Bonamassa talks new album, Strats, Dumbles and Hendrixs". musicradar.com. August 2014. Retrieved 6 Jan 2015. ^ "Keith Urban: Guitars, Cars & The Whole Crazy Thing". Retrieved 28 May 2018. ^ "Ben Harper and Jason Mozersky: White Lies for Dark Times". Retrieved 28 May 2018. ^ Inc., Equipboard. "Eric Johnson's Dumble Steel String Singer Amplifier". Equipboard. Retrieved 28 May 2018. ^ Administrator. "Metallica - Kirk Hammett's Guitar Gear Rig and Equipment". www.uberproaudio.com. Retrieved 28 May 2018. ^ "Rig Rundown: Jason Isbell & The 400 Unit". Retrieved 28 May 2018. ^ "Rig Rundown - Kenny Wayne Shepherd". Retrieved 28 May 2018. ^ "Adventures in Amplification: Lineage of a Dumble OD-100WR". Retrieved 28 May 2018. Wikimedia Commons has media related to Dumble amplifiers. "Three Ways to Nail the Dumble Sound on a Budget". Reverb.com. Retrieved May 28, 2018. This page was last edited on 22 April 2019, at 15:05 (UTC).